Color trends are a wonderful way to celebrate the seasons! According to Pantone one of the top colors for Fall 2014 is Aurora Red. Aurora Red is a more sophisticated shade that adds verve and spark. Members of the EtsyChristmasinJuly Team have many Aurora Red items in their shops! Here are a few! 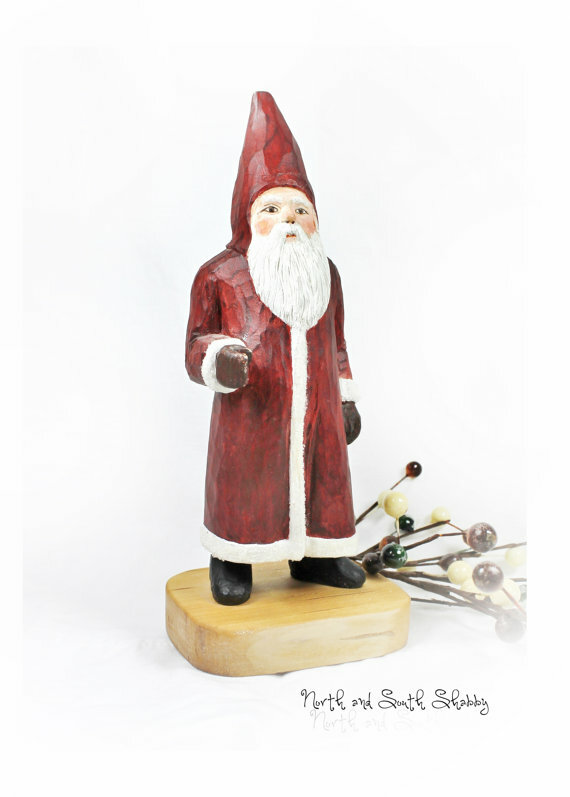 Patricia and Rebecca from northandsouthshabby found this cheery Santa at an estate sale. It is a beautiful example of hand carved folk art from the New England region. They love how each whittled cut is angled in the piece -it lends to the rustic charm! Beautifully carved, and gorgeously painted, featuring an earthy shade of red -or as Pantone calls it – aurora red! A wonderful shade that will not overpower your holiday decor! Lia from Ghirlandiamo says that creating this wreath, she liked using not the classic Christmas red but a bit different one. Lia wanted to create a particular contrast between the base color and the white snow flakes. What do you think about it? Amy from BeadsandThreadsbyAmy loves deep red for the holidays. When she found these hand cut lead crystal beads at a bead store on their travels to Southern Colorado, she knew they were screaming “ornament”. Here is the result of that lovely trip! Christine from cwagenblass9 says this is an interesting shade of red – great for Christmas items. G from PaperDraper shares This seems apt as she has what could be an aurora red in the sky! Her images for this collage were taken from a 1940’s newspaper and the lines behind signify a bomb blast with boy scouts cycling for their lives. Susan from SSFDesigns made this Aurora Red sequin evening dress for a custom order. She thought that the hardest part to making it would be getting the perfect fit and the boning detail , but it turns out that trying to get the picture taken with all the sequins was the hard part. Ordered as a custom order in her shop. msmadmax from madmaxshop says that Julie Barne’s (Peggy Lipton) probably wore a bodysuit similar to this one being one of the hippest and first young undercover female detectives. Soft and stretchy and easy to wear. Dig it!!! Rachel Palmer from 910woolgathering says the yarn she used in the scarf was the inspiration. The separate colors all lend themselves to go together, that it is always fun to try new pairings that she never would have tried. The shine and the drape are also added bonuses. Kristy Jo from KrystalKlarityBeads shares that she made this because it has such depth and a more natural feel than many other stones. She kept thinking of fall colors and the depth that nature shows in, say – a red Maple tree. She had a necklace of this already and the stones are smooth and comfortable so she wanted a bracelet as well. Kristy Jo likes to look at bracelets (when we wear them they are more visible to us ourselves) and she tends to look from the color of what she is wearing to the colors in nature when she is outside. Nancy Duncan from EponasCrystals says that while red is not one of her favorite colors, carnelian is one of my favorite stones. It can be orange to red in color, and these beads were in that red zone. Red brings a warm energy and is a nice color for fall and winter. Noel from MinkCouture lets us know this chunky bangle bracelet is made with beads wrapped and knotted with a vintage men’s tie. The tie is cream, mauve and aurora red. A funky accessory that can compliment any outfit. Isabel from CozyDetailz says that a Christmas inspiration to make this bracelet, using several and different red tones and calling it an Aurora Red friendship bracelet for all her friends in the world. candy frizzell from TrueEarthDesigns says we usually think of the orange and yellows of fall, but look at a autumn tree and you see a deep brick red as well. This is her favorite time of year. Elizabeth Berry from feesfusions says she made this pendant with a technique called a pot melt. Several colors of glass are melted together in the kiln and the end result is always a surprise as you really never know what the end result will be. Elizabeth really likes the reds in this pendant with a touch of white and black. collectique from Collectique says nice Norwegian tole in these two hand painted Aurora Red wall hangings. Gives a bright enhancement to any room, but she pictures them hanging in the kitchen since one is a cutting board and the other is a wall pocket or a knife holder. Matching floral designs and the green swirling leaves really deepen the lovely red background color.